The real story on foster care and real solutions for making it better. When Marcus Fiesel’s story of torture, abandonment, and a slow, agonizing death came to light, it was not exactly news to Holly Schlaack. She was an insider in the foster care system and Marcus’s horrible experience was just an extreme example of how she knew the system could fail. Happily, Holly had also seen some success stories that were as inspiring as Marcus’s story was appalling. So she set out to create a way for there to be more happy endings. This book is part of the effort. Invisible Kids tells the stories of many children and foster families. It tells them straight and backs them up with statistics and facts that show why the system works, why it doesn’t, and where it needs help. It describes the special program Holly created for early identification of red flags in the lives infants and toddlers. It details how this program, ProKids Building Blocks, is making a difference, with specialized training and home visitation checklists that assist in objectifying warning signs that might otherwise go unnoticed. It also identifies more than a dozen ways, large and small, anyone can apply to make a difference. When stories reach the news, an enraged public often jumps to conclusions or springs to solutions that are superficial and do not take into account the real issues. 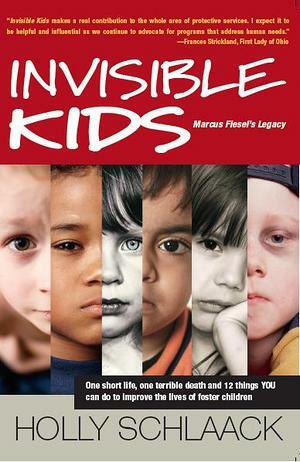 Invisible Kids goes in-depth so practical approaches and real solutions can surface. It is too easy to think that all children have a reasonably happy childhood. Sadly, we learn, some children have no childhood at all. In this day and age, this is neither necessary, nor acceptable. If you care about children, here are ways to put your caring into action.